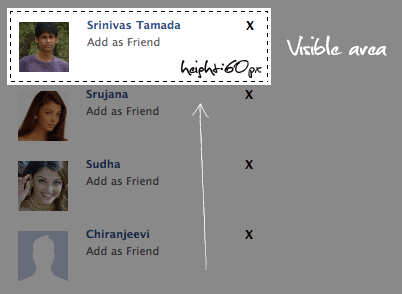 This post about how to implement Facebook-like users Suggestions. When you click delete(X) button "Do not show this suggestion" the content disappears slowly and to get the new suggestion content appears. I had developed this using jQuery, PHP just some lines of code. Take a look at live demo below. I prefere use this syntax because you can try directly your $sql with echo for example ;) and you can add many functions to drop injection. this code is nice, I was wondering if i click on that, will this works with any lightbox! i tried one this with one of lightbox is not working. any idea that might work with any other lightbox! I mean, if I makes the info in DIV from a database, is there a way to delete those records as well? ANy tutorial for delete comment? How to use this to delete post from database? Any idea how to do the same with a datalist control (in C#) rather than with list? I used the following code but it does not hide the datalist item when I click on the X. (I removed the script tags in this sample). hi some one,, can you help me about this statement? how do I display the user as a suggestion to make friends? Nice work Srinivas. I like all your posts. Those are just so simple. Qute informative and easy to understand and implement as well. Thank you.